It isn't too hard to tell that this bird is a sandpiper, and the short bill and legs indicate that it's a small sandpiper. The sandpiper genus Calidirs seems like a logical place to start. The slim, long winged look of our bird is all wrong for a Red Knot, at one end of the Calidris size spectrum, and all wrong for Least, Semipalmated, and Western Sandpipers at the other end. The bill really isn't long enough for a Dunlin or a Curlew Sandpiper, and both of these species have entirely dark bills. Note that the base of the lower mandible of our quiz bird is reddish and contrasts with the rest of the bill. More on this later. A Purple Sandpiper would be chunkier and shorter winged, not to mention much darker, at least during the fall and winter when the overwhelming majority of our Purple Sans are seen. A Sanderling would be whiter overall or show strong rusty tones in the plumage. The well defined breastband suggests a Pectoral Sandpiper but a Pec would have a greenish base to the bill. As mentioned before, the base of the lower mandible of our bird is reddish. Pecs also have greenish or yellowish legs, and though the legs of our bird appear to be covered in sand, the upper legs are bare and they look dark gray, not green or yellow. The long winged look is shared by Baird's Sandpiper but a Baird's would have warm brown tones about the head and neck. The head and neck of our bird look gray and whitish. A Baird's would also have a dark bill from tip to base. So where does that leave us? Well, with White-rumped Sandpiper. But, you protest, White-rumped Sandpiper is supposed to have streaking on the flanks and the flanks of this bird are unmarked! Not all White-rumpeds have flank streaking is the simple answer, which means that we have to have backup field marks to use when our first line field marks aren't available. The reddish base to the lower mandible is one such backup field mark and is diagnostic for White-rumped Sandpiper among the Calidris. 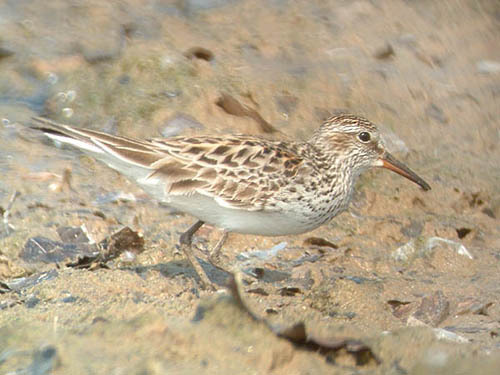 This atypical White-rumped Sandpiper was photographed at Montrose Beach in Chicago on June 16, 2006.